Gorges State Park is the access point to hike to one of our favorite waterfalls, Rainbow Falls, and Turtleback Falls swimming hole. It's home to rugged river gorges, sheer rock walls and one of the greatest concentrations of rare and unique species in the eastern United States. An elevation that rises 2,000 ft. in only four miles combined with rainfall in excess of 90 inches per year create a temperate rain forest. 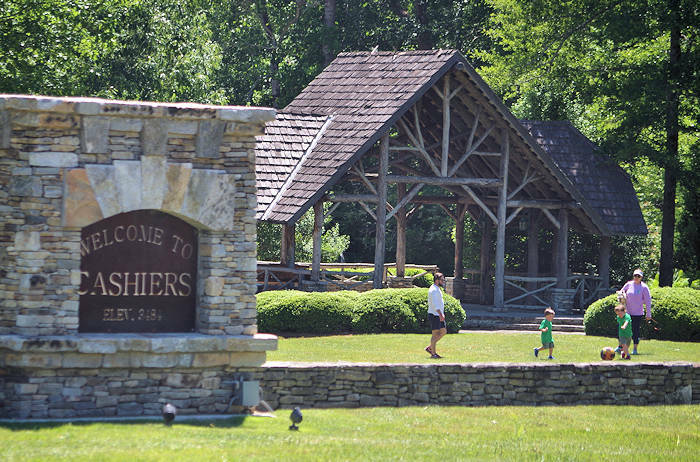 It's just 55 miles from Asheville, between Brevard and Cashiers. There are two access areas to the 7,700-acre park. The Grassy Ridge main entrance takes you to the primary hikes and co-built visitor center packed with displays explaining the area's history and ecological uniqueness. Enjoy the large balcony with picnic tables and a view. The park is considered “trash free,” so carry out your own trash. This relatively new North Carolina state park opened in 2009 with paved roads, parking areas, trails, primitive campsites and two picnic shelters. 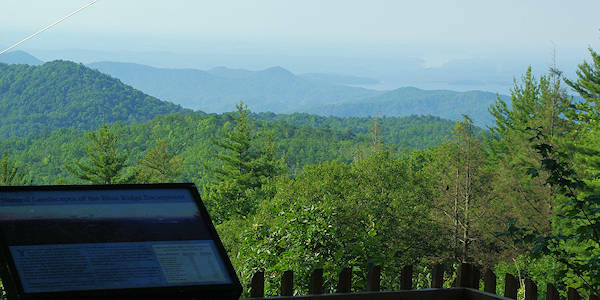 A wheelchair-accessible overlook has views across Jocassee Gorge and the Blue Ridge Mountains. There is no admission fee. Most of the park is remote with little access to protect its many ecosystems. Check in at the Visitor Center to get a map and find out about any trail closures. The 1.5-mile round-trip Bearwallow Falls Trail takes you to an overlook with a limited view of the Falls. Follow blue triangle blazes. The Bearwallow Valley Trail begins at the top of the picnic area by the information sign. This one-mile round-trip trek takes you to one of the highest overlooks at the park. At 3,200 ft. above sea level, you will enjoy views into South Carolina, including Lake Jocassee and Lake Keowee. Follow red triangle blazes. On the other side of the park is a 24-hour access area with restrooms, picnic area and longer trails. Anger Hole Trail is a strenuous 7.25-mile multipurpose trail that ends on the Foothills Trail. Hikers, mountain bikers and horseback riders allowed. Hikers get their feet wet crossing two river fords. Blazed orange. Cane Brake Trail is a strenuous 5-mile trail that ends at Lake Jocassee and the Foothills Trail. Yellow blazes. The Foothills Trail runs 6.7 of its 76 miles through the park. The total trail runs through North and South Carolina along the Blue Ridge Escarpment. It goes by nearby Whitewater Falls. Horses and mountain bikes are currently permitted on the Auger Hole Trail from the Frozen Creek Access to Turkey Pen Gap on the western boundary of the park. Hiking is also allowed on the trail. The Frozen Creek Access provides a picnic area and trailhead for this multipurpose trail. All visitors with horses must be able to provide proof of a negative equine infectious anemia (Coggins) test while visiting North Carolina State Parks. Some of the picnic tables are wheelchair accessible. Gorges State Park is a carry-in/carry-out facility. Recycling containers are located throughout the park. Find covered picnic tables on the back side of the Visitor Center. Also, find two picnic shelters. The Raymond Fisher Campground has 8 primitive campsites with fire rings, picnic tables and lantern hooks. A pit toilet is available. 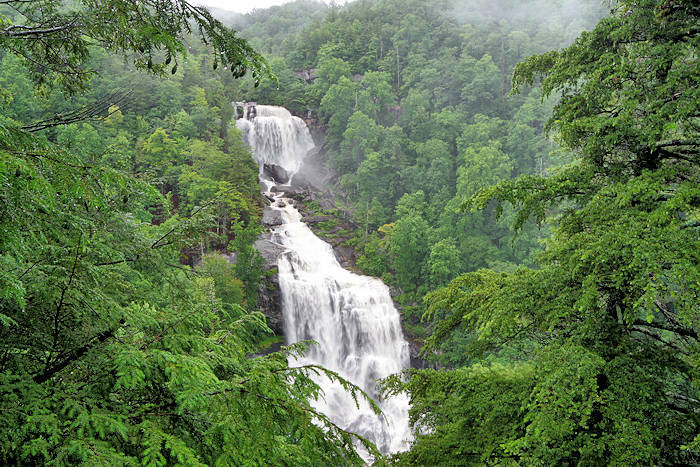 Take the 1.5-mile trail from the Grassy Ridge parking lot (where Rainbow Falls hike begins). There's a small pond. These sites are only available by reservation, for around $10/night. Reserve online. Gorges State Park is located in Transylvania County and joins the North Carolina/South Carolina state line. The park is approximately 55 miles southwest of Asheville (1.5 hours driving time). From Asheville, reach the park from I-26, taking exit 40 onto NC 281 and traveling west toward Brevard. Turn west on US 64 and travel toward Sapphire. To reach the Grassy Ridge Access (west side of the park with Visitor Center), turn south on NC 281 in Sapphire. It's 7/10-mile to the entrance. To reach the Frozen Creek Access (east side of the park), turn left onto Frozen Creek Road from US 64 about two miles past US Highway 178. 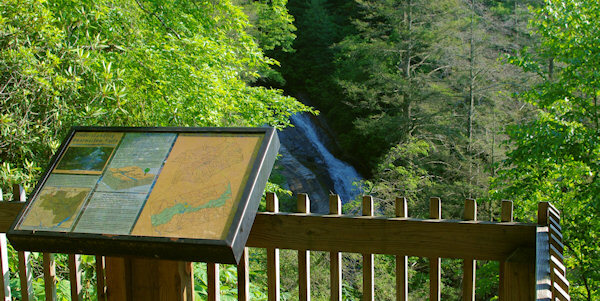 Upper Whitewater Falls and Panthertown Valley with Schoolhouse Falls are nearby. Open every day 7 AM until midnight. The visitor center is open 8 AM-5 PM daily. Closed Christmas Day. Phone: 828-966-9099. Gorges State Park is located along the Blue Ridge Escarpment, an area where five streams carry water to the ocean from the divide between the Tennessee Valley drainage and the Atlantic drainage. The upper reaches of the escarpment mountain streams gradually descend, but near the state line the water plunges over waterfalls and rushes through steep-walled gorges. 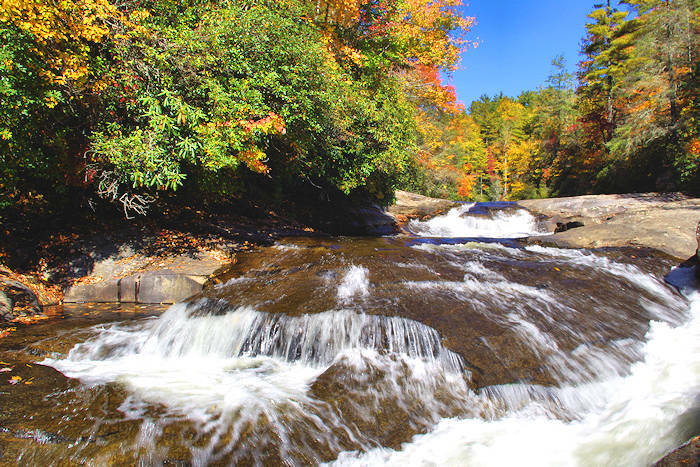 With such a rugged and contrasting topography contained within a small area, the park includes 21 of the 44 natural community types known in the mountain regions of North Carolina. 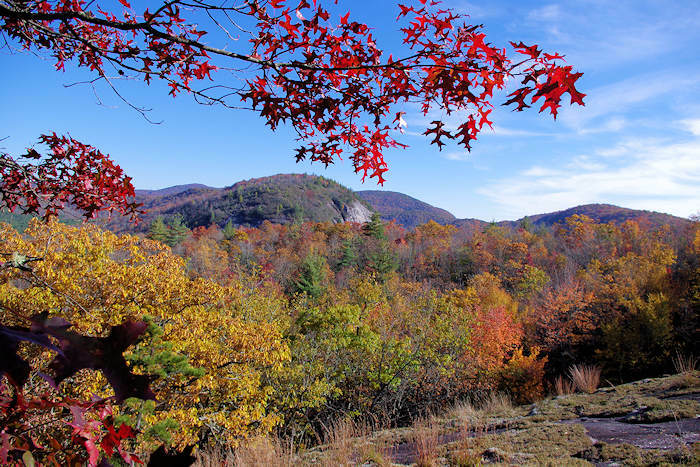 Nearly 125 rare plant and animal species that occur in the mountain counties of North Carolina are found in the park, in addition to 12 endangered or threatened plant and animal species. This natural water slide on the Horsepasture River drops into a deep, refreshing pool. 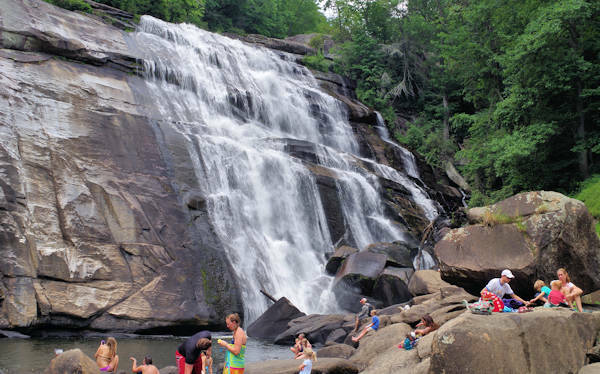 It's near the beautiful Rainbow Falls, accessed from Gorges State Park with a 3.5-mile roundtrip hike. 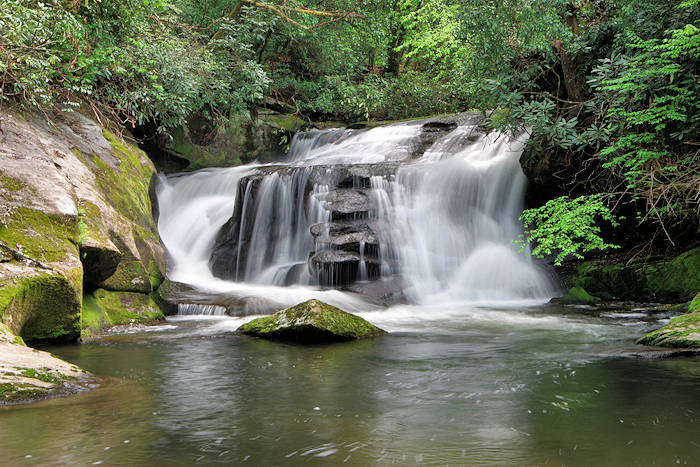 (2.5 miles roundtrip, strenuous) Hike to Stairway Falls on the Horsepasture River from Gorges State Park via the trail to Rainbow Falls in Pisgah National Forest.